Technavio analysts forecast the global container weighing system market to grow at a CAGR of over 6% during the forecast period, according to their latest report. The research study covers the present scenario and growth prospects of the global container weighing system market for 2017-2021. To calculate the market size, Technavio analysts consider the revenue generated from the implementation of software-defined storage solutions among enterprises worldwide. Container weighing systems comprise a significant part of the global transportation sector. Checking the weight of containers before they are loaded is integral to avoid accidents caused by overloading. Various modes of transportation have their weight parameters, but the extensive use of containers provides a standard metric of measurement, helping the extensive adoption of container weighing systems. Maritime trade is the most commonly used mode of transportation in international trade, representing about 85% of total transport volume. The demand for both maritime transport services and logistics services comes from the global economic growth and the need to carry out international trade. As a result, the global shipping industry and maritime transport activities (notably seaborne trade) were affected by the reduction in the global GDP and international trade volumes in 2009. The steady adoption of automated facilities at several major ports is likely to have a crucial impact on the global container weighing system market. Due to the large-scale use of containers in marine trade, ports are the leading application sectors of the market and are likely to retain a dominant share of the market during the forecast period. “Ports undergoing automation-oriented upgrades are expected to incorporate container weighing systems in their automatic container handling systems during the forecast period. 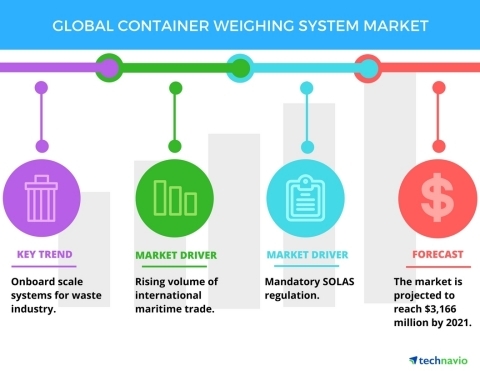 This can become a steady revenue source for the global container weighing system market during the forecast period. Container weighing is an emerging and increasingly-busy market,” adds Sharan. The purpose of making the weighing of sea containers mandatory by IMO is to make the entire container supply chain safer. This regulation is expected to be issued by the International Convention for the Safety of Life at Sea (SOLAS Convention) because of some accidents involving container stack collapses and container losses. To weigh a container and utilize the load information to update the stowage plan, containers must be weighed preferably at the completion of packing. Weighing export containers must be done sufficiently in advance for the stowage plan to be optimized. If the actual weight is not calculated at the completion of packing, the port is in a prime position to provide the service or verify the documented weight.